Today Im reviewing a training product by Randy Chinn called Simple List Building Formula. 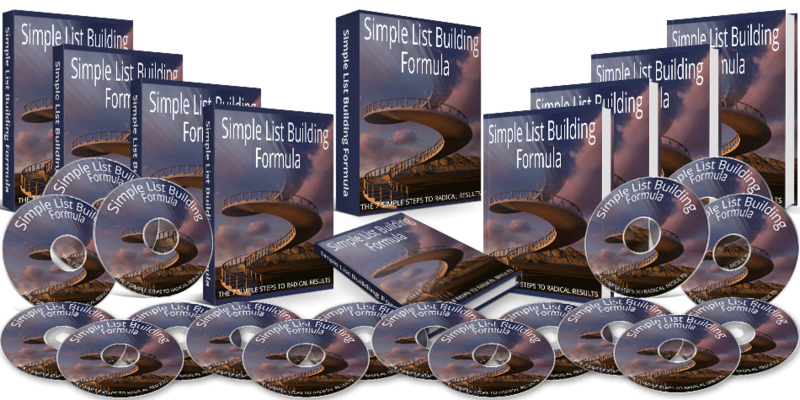 Simple list building formula is a comprehensive video training program that is designed to take you through the steps of building an e-mail list for the affiliate marketing. This takes you step but step through the process of selecting your auto responder, setting it up, building your squeeze page etc. The very first thing I did notice about this is that this is a course that is not intended for the advanced user. Its geared towards the newbie . If you are an advanced user who is already experienced in e-mail marketing then this will be just a review for you. However if you are a new user then this is an ideal product for several reasons. 1) The tutorials cover everything you need to get started. The videos are clean and well written. Listening to Randy is enjoyable, he is well spoken and his voice lends itself well to this kind of media. Many times when I look at a training product the low quality of the videos just drives me nuts. I just can’t wait for the video to end. This is not the case with Randy and the Simple List Building Formula..
2) Randy has really gone out of his way. There are over 2 hours of training that takes you step by step through the process from selecting and setting up your auto responder, to building up your list , to sending emails, to establishing a relationship and trust with your list. He even includes free PLR that he created for people so that they would have something to give away for their first squeeze page. Everything you need to get started with list building is right here. 3) Randy’s attitude. Its very good! I spoke to Randy for about an half hour on Skype and one thing was very clear. Randy has an honest desire to help people. He really comes across as a nice guy. While I’m sure he wants to make a few bucks for his efforts (which isn’t a bad thing) I could tell that Randy is the kind of guy who genuinely wants to be helpful. This is a refreshing change from so many self proclaimed IM gurus who make a low quality training product and have no interest in offering any value. You can even see his desire to be helpful and offer quality in the product itself. His product is a video training course. For most people that would be the end. But not for Randy. He transcribed the entire 2 hours worth of video just in case buyers would prefer to read it instead of watch it. But he didn’t stop there. He also made audio training and includes the entire thing as a .MP3 just in case buyers would prefer to listen to the training while they are jogging or driving to work. Even there he didn’t stop. He also includes a FREE Skype call with him just in case buyers have a question after taking in the training content. All of this screams not only a desire to really teach, but also professionalism. Given that this product covers all the bases and teaches everything your going to need to know to get started, comes with free PLR for your first squeeze page, and even includes a free Q/A session with the product creator I have to say that I’m quite impressed. Add to that the fact that its created by a seller who obviously goes out of his way to provide real value and has a genuine desire to be useful to his customers and it really is a no brainier. If your looking to get started with email marketing then this is the training product you need to get you going quickly. Any one of the 3 aspects of this product (Training, PLR, Q/A session) are worth more than the price of this course. But you get all 3 of them for less than the cost of a trip to McDonald’s. Click the link below for more information or to get started.